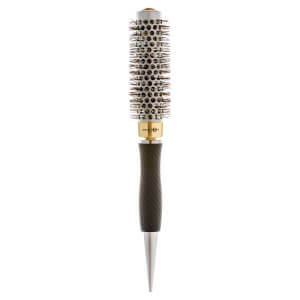 Receive a FREE Head Jog 117 Gold Thermal Ceramic Radial Hair Brush with your purchase. Create beautiful curls with the Electric Head Jog Gold 32mm Titanium Waving Iron, a curling tong with slim, gold-titanium coated barrel to create smooth, shiny curls. 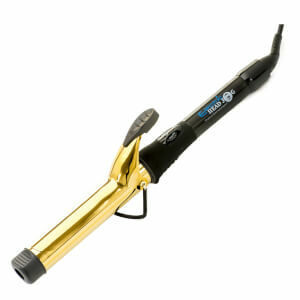 The 32mm barrel creates professional-looking, voluptuous curls, and its variable temperature control from 120°C to 230°C evenly distributes heat through the barrel for consistent results. High ionic output ensures heat is directed inside the hair, preserving hair's natural moisture and protecting the external structure from drying out. The curling iron's safety cool tip keeps fingers protected during styling, and its 360° swivel 3 metre power cord makes for easy handling. 360° swivel 3 metre power cord.